Helps to eliminate scars and dark spots. 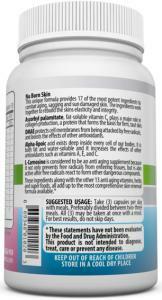 Contains the anti-aging power house ingredients DMAE, Alpha Lipoic Acid, and Carnosine. In addition, there are 14 other Anti Aging vitamins, herbs and super foods. 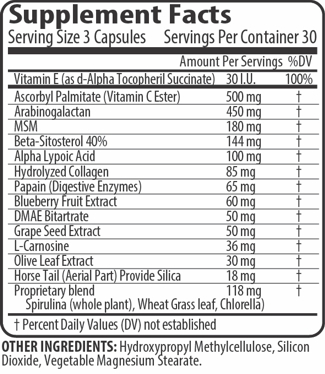 They are as follows: Vitamin E., Blueberry extract. Grapeseed extract, Hydrolyzed Collagen, MSM, Beta-Sitosterol, Arabinogalactans, Digestive enzymes, Olive Leaf, Silica, Spirulina, Wheat Grass, and Chlorella. 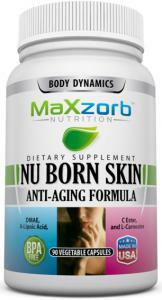 Maxzorb Nu Born Skin contains 18 ingredients to give the body what it needs to build healthy skin from the inside out. These are the most potent ingredients known to combat all the things that rob of us of the beautiful skin that we want. Each bottle contains 90 capsules, a one month supply. Ascorbyl Palmitate (C-Ester) This nutrient is a fat-soluble form of vitamin C. It plays a major role in collagen production, a protein that forms the basis for connective tissue. It is an effective free radical scavenging antioxidant, which promotes skin health and vitality. One of Americas leading dermatologists, Dr. Sheldon Pinnell of the Dermatology Department of Medicine at Duke University Medical Center, published research on vitamin C's collagen stimulating effects in the Yale Journal of Biology and Medicine. DMAE (Dimethylaminoethanol) is a chemical naturally produced in the human brain and is found in small amounts in fish. It has been reported to enhance brain activity. DMAE protects cell membranes from being attacked by free radicals, and boosts the effects of other antioxidants. Scientific studies show that it reduces age spot formation due to aging. It helps the skin recover from day to day abuse suffered from pollutants in the air, water, and food. This means less wrinkles, under-eye puffiness, smaller pores and acne scars. Vitamin E plays an important role as the major lipid soluble antioxidant that protects our bodies against free radical damage. It improves circulation, is necessary for tissue repair, and maintains healthy nerves and muscles while strengthening capillary walls. In addition, it promotes healthy skin and hair. Carnosine is considered to be an anti-age supplement. It not only prevents free radicals from entering tissues, but also, once free radicals react to form other dangerous compounds, it actively protects each cell from these damaging second wave chemicals. It also has wound healing capabilities and is an immune booster. Blueberry extract This antioxidant was ranked #1 in antioxidant activity compared with 40 other fruits and vegetables. Dr Joseph at Tufts University is delving into the fascinating study of memory loss and aging and has found that natural phytochemicals in blueberries seem to reverse some of these processes. Grapeseed extract contains bioflavenoid complexes that perform as free radical scavengers in the human body. These are called OPC's (Oligomeric Proanthocyanidins). These are the most powerful bioflavenoids and are assimilated into our body tissues when consumed. Dr. Jacques Masquelier, discovered that these bioflavenoids strengthened blood vessel walls within hours of ingestion! These potent bioflavenoids have also been shown to reduce skin aging. Hydrolyzed Collagen is a modified form of collagen protein that has been broken down into smaller pieces by enzymes which enable better absorption into the small intestine to be used more efficiently by the body. All connective tissues require collagen which is used to repair skin, bones, cartilage, tendons and ligaments. MSM (Methylsulfonylmethane) is an odorless dietary metabolite of DMSO. This naturally occurring bioactive form of sulfur provides reduces skin inflammatation. MSM also has sulfur containing amino acids, collagen and disulfide bonds. It is good for skin, hair, nails, joints, circulation, immune function and respiration. Beta-sitosterol is one of several phytosterols, plant compounds with chemical structures similar to that of cholesterol. Over the past few years this particular phytosterol has been tested for promoting healthy cholesterol levels. Among many other health benefits, it stabilizes blood sugar and is particularly good for maintaining healthy skin because of its immune supporting capabilities. Arabinogalactans are extracted from the Larch tree. This substance is receiving an abundance of attention from the scientific community as a botanical compound that has been shown to improve performance of the immune system. It also fosters the growth of favorable flora in the intestines, which may play a role in the modulation of the immune system. Digestive Enzymes occur naturally in the body and their purpose is to aid food enzymes in digestion. These are protease, which breaks down proteins, amylase which breaks down carbohydrates, and lipase for the breakdown of fats. Due to the fact that our foods are depleted of enzymes because of cooking, and other food processsing, it becomes is important to add this nutrient to our diet to ensure proper assimilation of nutrients. Olive Leaf The active ingredient in Olive Leaves is called oleuropein. Olive leaves are reported to support the immune system, increase energy, and have an internal cleansing effect. It has also been shown to control blood pressure and help stabilize blood sugar levels. Silica When facsilica is ingested, our bodies convert it to a form of calcium readily used by our skin and connective tissues. Calcium is a necessary nutrient for beautiful, radiant and firm skin. Herbal blend of Spirulina, Wheat Grass, and Chlorella These herbal super foods are high in naturally occurring vitamins, minerals, antioxidants and amino acids. This blend of potent plant extracts contains a high amount of chlorophyll, which is very cleansing to the whole bodily system thereby contributing to clearer more beautiful skin. By adding these nutrients and super foods to a diet rich in fruits, vegetables, and lean proteins, you'll see dramatic improvement in acne prone, sun damaged, sagging skin. It's also important to drink at least eight glasses of pure water every day, exercise, and protect your skin from the harmful rays of the sun.